The Division A (P1) start, with the Swan 53-2 Blue and J/124 Courage hot on her tail. The Farr 52 Zamazaan is sailing to windward in the background. 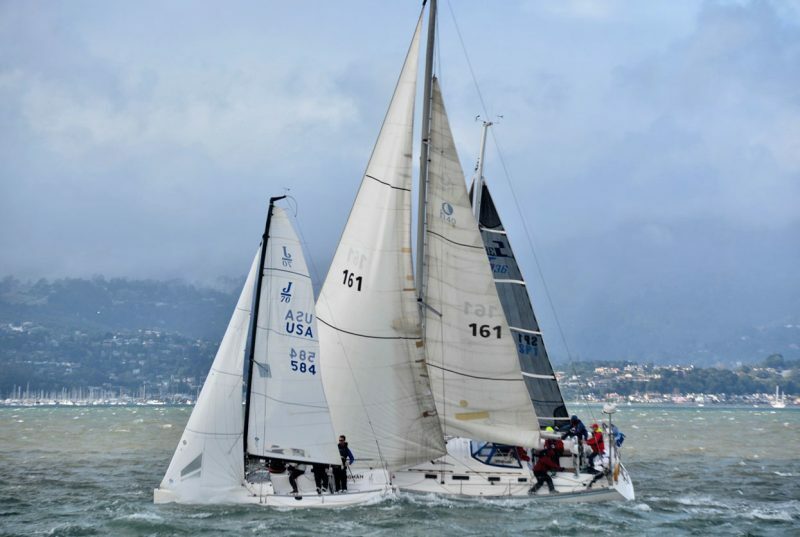 Any workable breeze failed to show up for the Corinthian Midwinters on pleasant Saturday, January 19, and the race committee was never able to come out of postponement. But Sunday the 20th was just the opposite. A low-pressure system blowing through the San Francisco Bay Area carried with it gusts up to 30+ knots from the northwest. A big division, P2 scrambles at the start. Three were over early. Wayne Koide’s Sydney 36 CR Encore won her division. Photographer and race committee volunteer Roxanne Fairbairn was well situated on the signal boat to capture the excitement on the start-finish line. You can see more of Roxanne’s excellent photos on her SmugMug site. The always-competitive J/105 start. Six of the eight boats signed up made it out on Sunday, and look how tightly they’re packed at the line. Tim Russell’s Ne*Ne won her class. The P4 start. 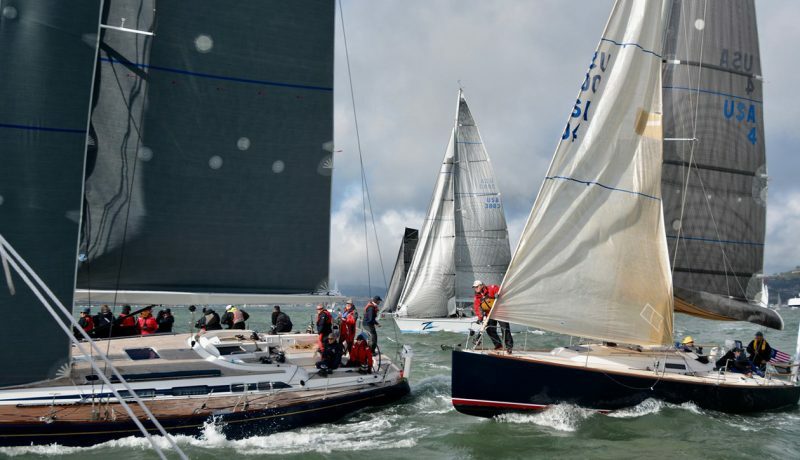 The PHRF divisions were broken up by rating, thus a 40-ft Hunter racer/cruiser (Sir Leansalot) was competing with the diminutive J/70 Wingman Racing. Elliott James (Roxanne’s son) and crew on the Mancebo 31 Bloom County topped the division. Look for our race report and a few more photos in Racing Sheet in the February issue of Latitude 38, coming out on Friday, February 1. Reefed mains were the call for these Non-Spinnaker 2 boats. 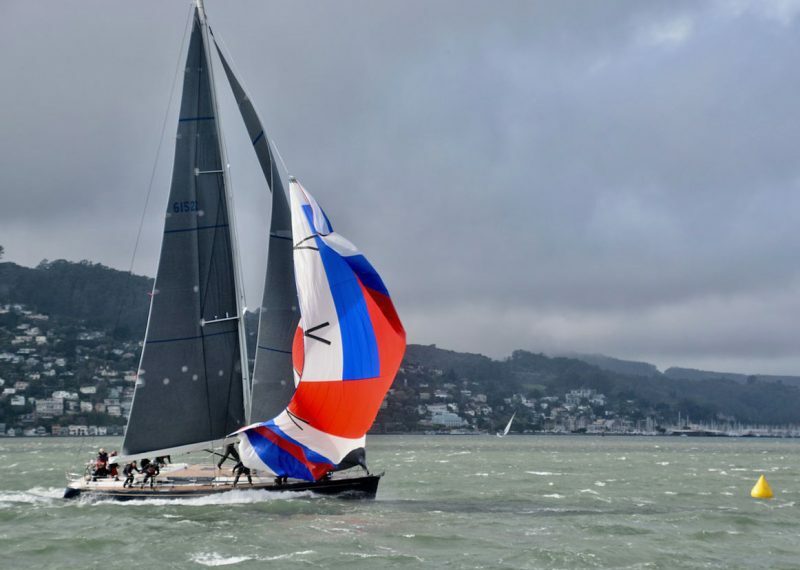 Note that the Ranger 33 Summer Sailstice (right) has a double-reefed main and partially furled #2 jib. They came in second after Carl Flemming’s Tartan Ten Topgallant. Ray Paul’s Blue was the first boat to finish. She held onto her time to win P1 by five minutes. 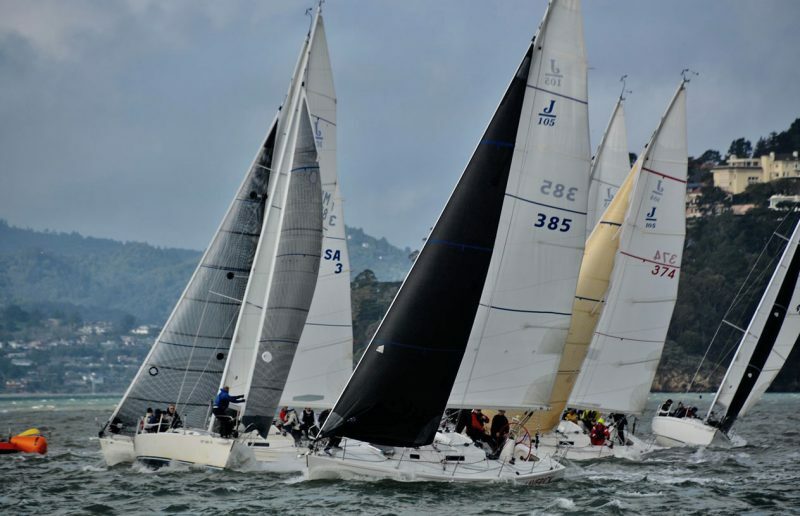 Find scores from the day’s race at https://race.cyc.org/arr/502/1/results. 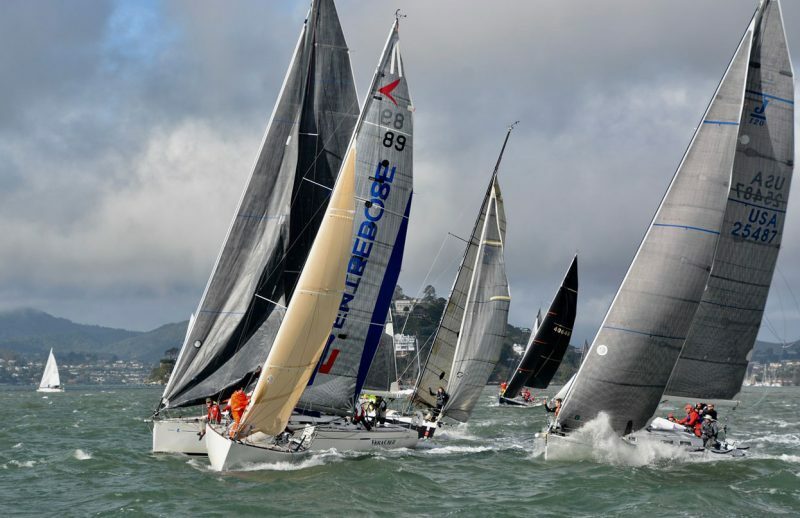 CYC will hold next and final races in the Midwinter Series on February 16-17. 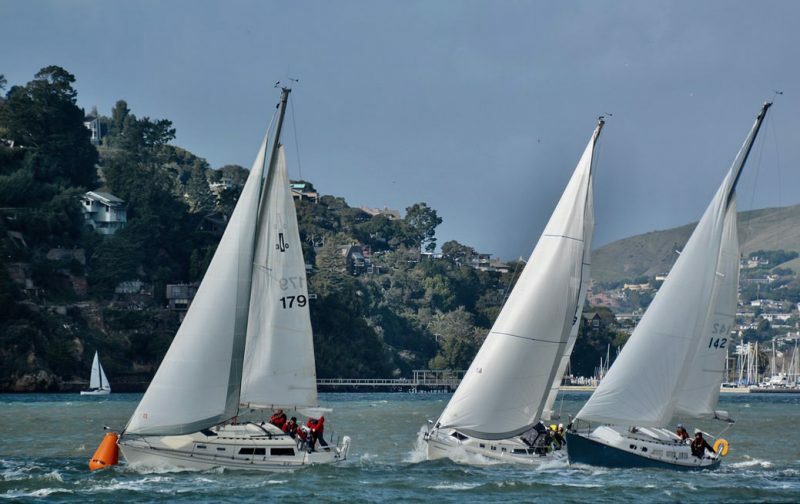 Go to https://race.cyc.org/2019midwins/enter to sign up. It’s always fun to gather with 300+ sailboats on the Cityfront Saturday morning to start the TBF. On Monday, we wrote at length about this Saturday’s Three Bridge Fiasco — one of the largest races in the country. Since Monday, entries have gone from 230 to 296 and counting. Today (Wednesday the 23rd) is the deadline (at 11:59 PST). If you’re sitting on the tideline wondering which way to go, now’s the time to decide. You can register here. 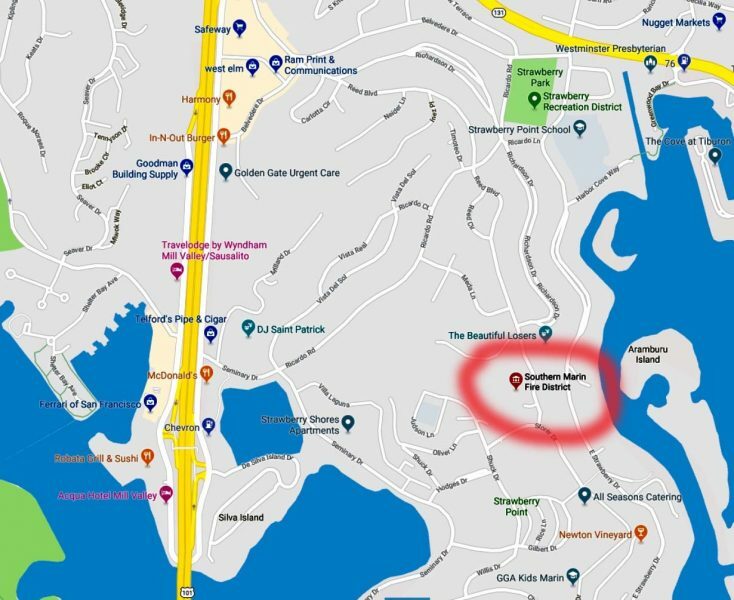 To get to the Southern Marin Fire District station, take exit 447 off 101, then take CA 131E Tiburon Blvd. 0.8 miles right on Strawberry Drive. Take a right onto Ricardo Road and proceed to the top of the hill. Go immediately left onto Reed Blvd., then go 0.4 miles to SMFD. Here’s a list of what the North Bay Coast Guard Spouses Club is asking for: diapers/wipes (sizes 1-5) laundry and dish detergent; paper towels; canned food items; peanut butter and jelly; bread; formula; feminine products; razors, shaving cream; cereal; mac ‘n cheese; pasta; rice; non-perishable foods; dog and cat food; Safeway gift cards; gas cards. For more information, please contact Meghan Wood here. And please stay tuned for news of future collections. On Saturday, a 21-ft boat ran aground in the notoriously (but deceivingly) shallow waters of Suisun Bay, according to a Coast Guard press release. It is not clear if the vessel was a sail- or motorboat — but it began taking on water. There were two people onboard. This screenshot is NOT from Saturday’s rescue, but it reflects a familiar story. This video was shot in July 2018 after a 22-foot sailing vessel ran aground and began taking on water with a family onboard. Suisun Bay claims many boats in its shallow, muddy waters every year. As with so many groundings in Suisun Bay, rescue boats could not reach the stranded vessel due to the shallow depth of the water. 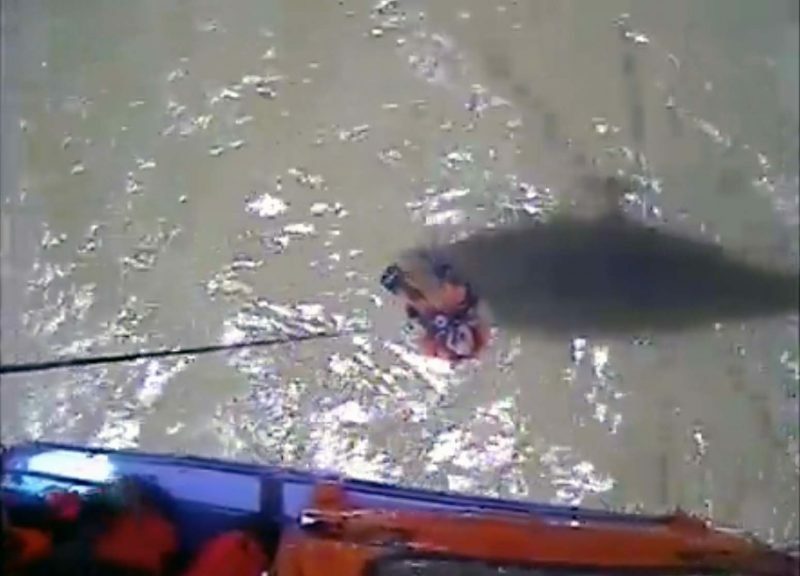 The Coast Guard helicopter lowered the rescue swimmer and they eventually hoisted both boaters to safety. They were then flown to Buchanan Field Airport in Concord and were reported in good condition. At least someone is doing their job. Friday will mark the second time this month that some 800,000 federal workers — including the Coast Guard — have gone without a paycheck, assuming a bill isn’t passed tomorrow. It’s not clear what progress has been made with the “Pay Our Coast Guard Act.” Though it’s received wide bipartisan support, there’s no indication that the bill is moving through Congress. It’s not as random as lightning striking twice, but it feels almost as close. Over the past year, we’ve slipped a handful of flyers into some random magazines that are distributed to our more than 700 locations up and down the West Coast. 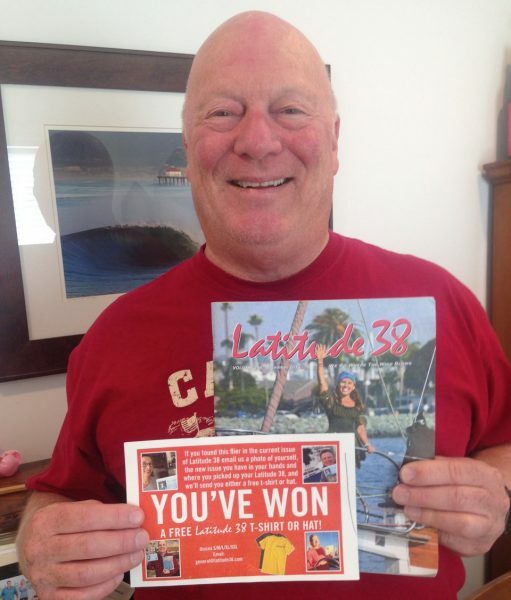 If you happen to be the one who picks up a magazine with a flyer, congratulations! You win a T-shirt. Pretty simple. 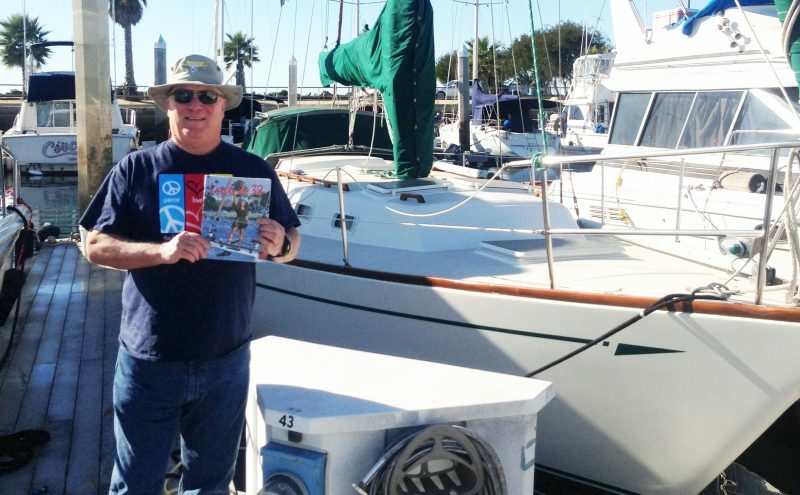 Phil Jay with the winning issue in front of his Cal 39 Yankee Traveller. As requested, Phil confirmed the flyer was really there with a “you-can’t-make-this- stuff-up” photo. Stranger things have happened, but we’re happy to discover that the Jay brothers still enjoy sailing in both Northern and Southern California. 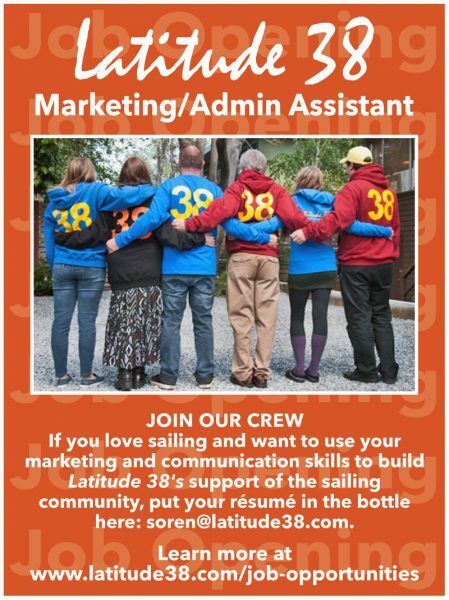 We just want to get the next photos of them out sailing with their new Latitude 38 T-shirts on.